This website is updated only occasionally so please also visit our Play Store or YouTube to see screens and features — or just install the app to see the very latest additions and changes. As an example of the many recent changes since the old screens below it were updated, here’s a screen capture from an inexpensive Samsung Tab (SM-T350) in 2017. This screen capture was done March 28, 2014 on a Nexus 7 tablet showing Nexrad radar on Avare 5.4.5 in Landscape mode zoomed out to show precip with GPS acquired, AEX as destination, and the device stationary on the ground. Note that some of the Dynamic Fields (across the top) have been changed from defaults by the user, with background on. 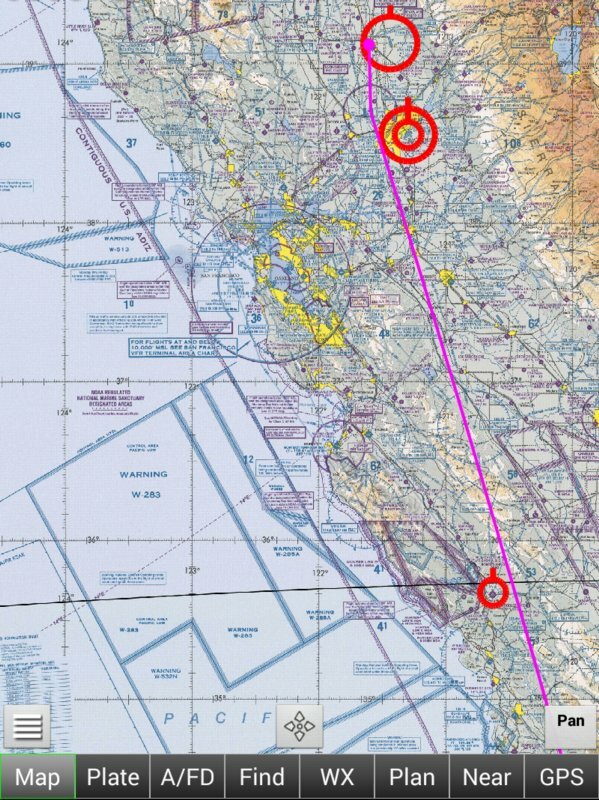 This screen capture was done October 1, 2013 on a Nexus 7 tablet in Portrait mode showing an Active Plan from IZA to O52 via SMF to avoid TFRs. 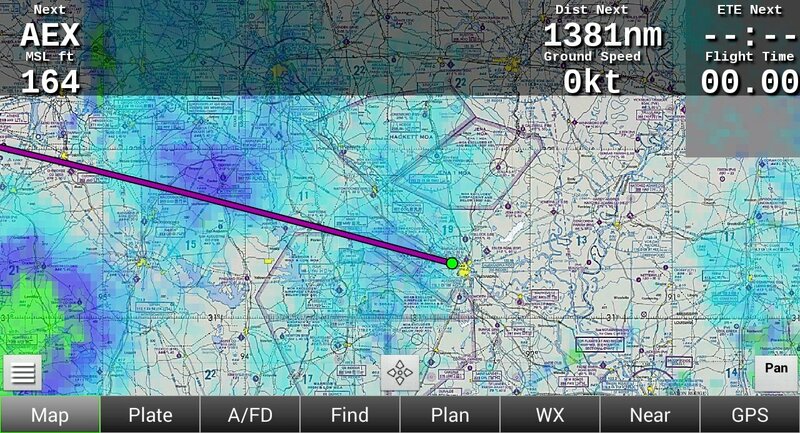 Chart Type is set to WAC and zoomed out to show the entire route. These screen captures were done September 30, 2013 on a Samsung Galaxy S4 phone running Avare v5.0.9 (click any image to see a larger version). 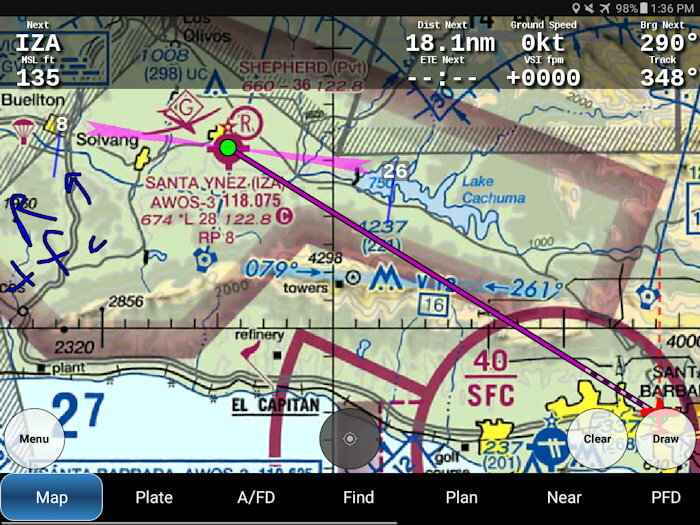 The GPS screen shows how the S4 phone performed while on a kneeboard inside a C-172 on the ramp with the engine running and avionics active. The Plate/AD screen shows position on the ramp. The A/FD screen shows the Avare version 5 line sequence, with fuel (100LA = AvGas & Jet A) and frequencies at the top. Note the thin gray scroll bar below the Menu buttons at the bottom, indicating that unlike on a larger tablet not all buttons can be shown simultaneously on a phone. This screen capture was done September 27, 2013 on a Samsung Galaxy S4 phone running Avare v5.0.9 in Portrait mode with GPS off. This was after pressing the Options button and using the extended zoom buttons (“-” and “+” buttons above “North Up” button) to zoom out. 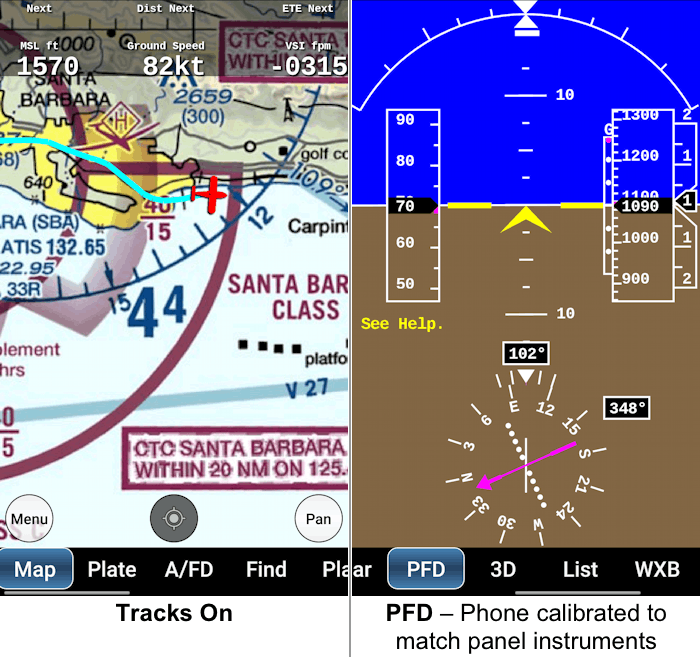 Using a WAC chart rather than this LA Sectional, large areas may be seen clearly in one screen even on phones. This view could have been zoomed out much further using the extended zoom feature. 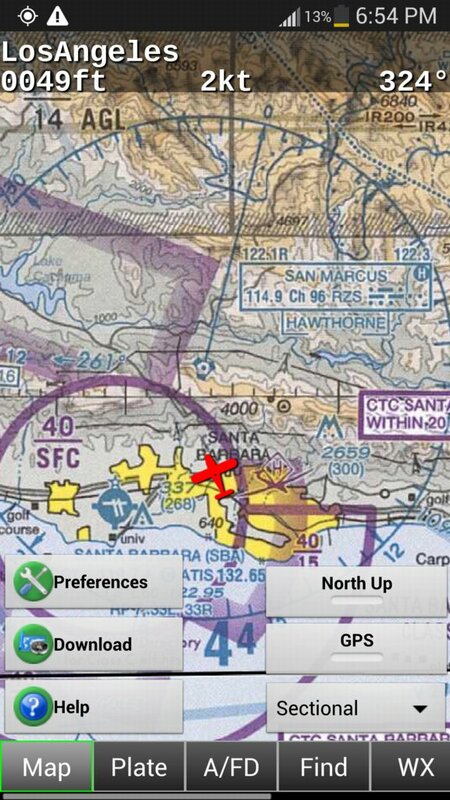 This screen capture was done September 16, 2013 on a Samsung Galaxy S4 phone running an earlier version of Avare during a VFR offshore approach to left traffic, runway 25 SBA. The current ground track (red dashed line) is offshore. Nearer the airport, a right turn will be made to join left traffic for runway 25. Because SBA has been input as the Destination, the direct route (black/white dashed line) points to the airport. Note that all of the Menu buttons across the bottom are visible without scrolling, in Landscape mode on the Galaxy S4 phone. This next screen capture was done September 16, 2013 on a Samsung Galaxy S4 phone after pressing the Options button in Map view while walking near the airport with no Destination selected. Note that because we are now in Portrait mode only some of the Menu buttons are displayed on this 5″ screen, requiring scrolling of the Menu bar to see the rest (as indicated by the thin gray scroll bar at the bottom). Because no Destination was selected, Avare notes at top-left that the current map being displayed based on location is the Los Angeles Sectional. This collection of sample “screen captures” was done on a Nexus 7 mini tablet running the much older Avare version 3.5.7 on March 2, 2013. 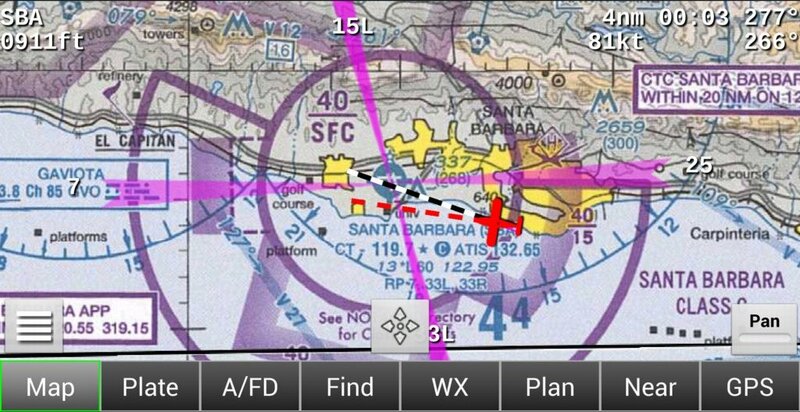 The device was stationary on the ground near the Santa Barbara Airport (SBA). Note: Click on any image to see a larger version of that image within a slide show that will enable you to page through all the screens, and when viewing the larger size a Description may be available if you scroll down. As you’ll discover after installing the app, reading the Help, watching the videos, and reading the Forum, the basic features are very similar but many have been added or improved and the user interface has been updated.